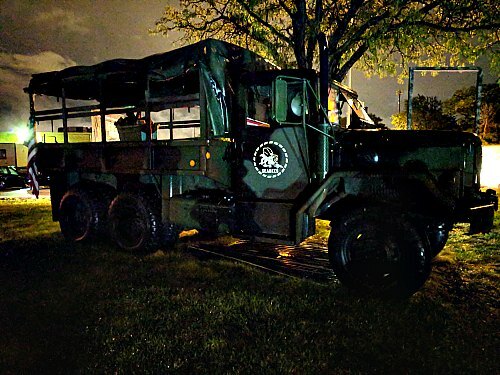 Midnight Terror Haunted House is a Haunted Attraction located in Oak Lawn, IL. 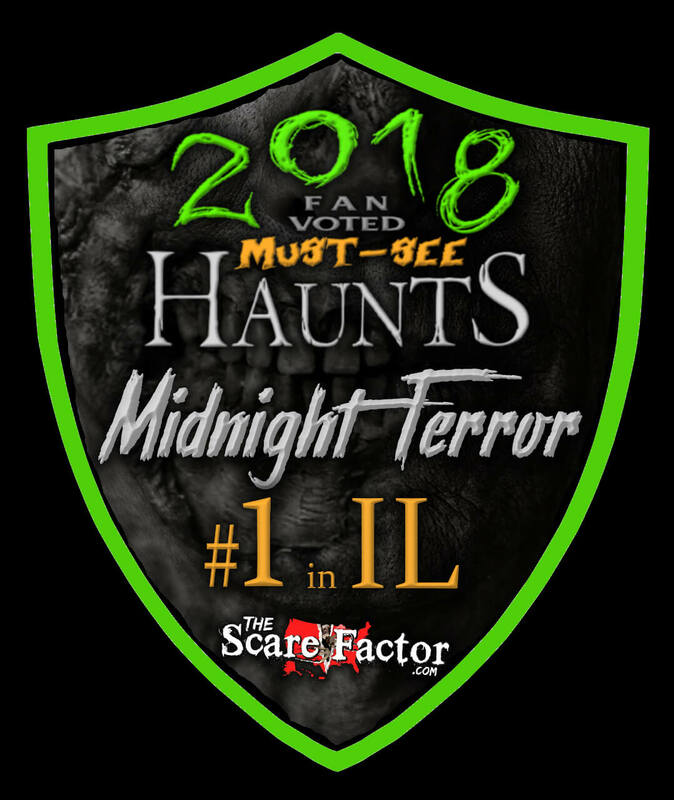 Midnight Terror Haunted House (MT) is a fairly new attraction making it’s way into the haunt scene with 2017 being their second season. Formerly, the attraction was operated as a home haunt before moving to their current location and their growth has spread like wildfire. This year, MT is offering guests more than 60 rooms of terror spread across 26,000 square feet! 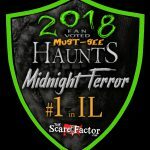 MT consists of two attractions: “Black Oak Grove: The Following” and “Factory of Malum,” as well as a small finale maze called “Chainsaw Alley.” This was our first trip to Midnight Terror, so we weren’t sure what to expect. All we knew was that their website looked awesome and so did many of their character pictures! We knew we would be in the area, visiting a couple of other haunts, so we thought, “Hey, why not?” Boy, were we in for a surprise! Both haunts were absolutely packed with highly-energetic actors, unsuspecting frights and we even found some impressive scenery! If you’re planning on visiting these guys this season, it’d be best to put your big girl pants on and leave your purse at home (or at least in the car). We were informed by the owner that between 80 and 100 crazed civilians and madmen can be found here on any given night, which was very believable and, for a haunt of this size, we were left with very few moments to stop and really absorb what was going on around us. There were so many irate, psycho tormentors that at least one or more were found around seemingly every corner! The large variety of characters seemed to be MT’s own custom creations, ranging from nurses and clowns to a demonic priestess and armored, skull-headed brutes. Dialogue was usually elevated to the line between talking loudly and screaming, but several also managed to interact with us some while we were in their scenes. Those that didn’t really talk TO us were using maniacal jibberish, growls or unexplainably-unsettling noises. These people have all lost their minds and one guy even lost his arm! One of the queue actresses came sliding directly at us with a baseball bat, another actress was eating blood off of her hands and an intimidating actor stopped us in our tracks by slamming his hand into the wall, thus effectively blocking our path. 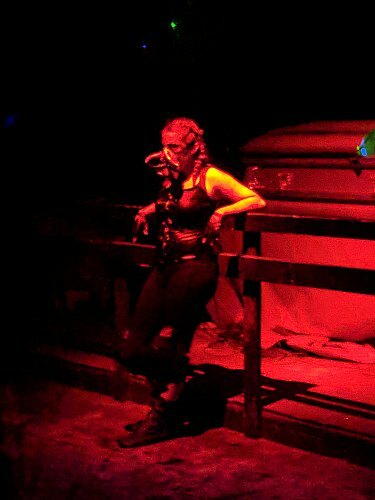 Others were climbing the walls, writhing about like contortionists or otherwise contributing to the massive chaos that was, apparently, Midnight Terror. The two that gave us the rules were also good and actually seemed to have the most rehearsed and believable performances of the tour. Though, it was a little hard to hear them over the music coming from the queue at times. Even with such a wide variety of characters, each sporting their own necessary apparel, there seemed to be a common “look” throughout both attractions… somewhere between pre-apocalypse and apocalypse proper. Blood, grunge and generalized filth was a common trait amongst most of the monsters within. Some utilized airbrushed makeup, some used full-head silicone masks, others had colored contacts and special teeth, but each of them looked their parts and matched their surroundings. None of them looked especially unfinished or out-of-place… even the ghillie suit (which is unique, for an indoor haunt)! Some of the most memorable maniacs include the horned priestess and the school girls. We had never been to MT before, so when we arrived at the haunt and tried to park, we were a bit confused when we were told to park at a different location (this is our own fault for not checking their website). We discovered that there IS limited local parking near the haunt and they strongly recommend that guests park at the secured Oak Lawn Parking Garage. 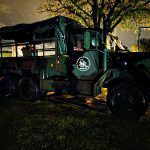 From there, you will be taken on a 5-minute interactive shuttle ride to the haunt and it’s FREE! We did park at the haunt so we missed out on the shuttle service. 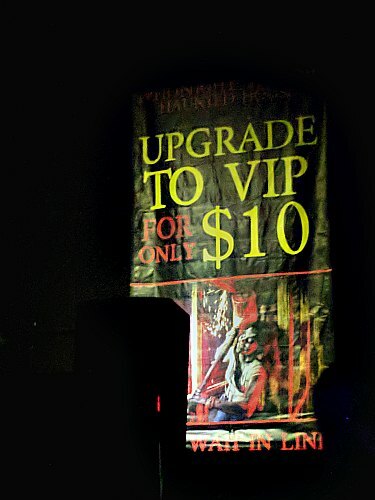 Several large signs are in place to confirm you’ve arrived at a haunt and will help direct you to the ticket booth. Professional staff members can be found there and at the entrance to each attraction to help customers if you have any questions or concerns. The building takes place in a large industrial building, so lots of smooth concrete floors made getting through the haunts a breeze. However, there are some times when you’ll need to basically crawl, so be prepared to get low! Got rain? Have no fear… MT’s ticket booth, main queue areas and 2 main attractions are all indoors and the queue area is even heated! Though, the outdoor maze is, of course, dependent upon the elements and may close if it rains. Shirts are available for those who like to stock up on haunt memorabilia and they are included with some of MT’s combo packages. As mentioned above, Midnight Terror takes place in an industrial building. We didn’t hear many sounds or see any roaming actors outside to help get us excited to go inside. However, this was largely due to the fact that the outdoor chainsaw chase maze wasn’t going because of storms on the night of our visit. We could imagine that the roars of chainsaws and the screams of petrified customers can normally be heard throughout the nearby parking lots. Once inside the building, the queue line area felt more like a haunted party scene. There was a stage for a band, colored lighting and music that was loud enough to make it hard to talk to those standing next to us. Several queue entertainers made appearances here and made sure everyone was on high alert before going inside the first haunt. After knowing how this haunt originated and that they’re only in their second year at this location, we were actually quite impressed at some of the effects that Midnight Terror has to offer. In one of the first scenes, we had to walk through a towering church facade that was seemingly nestled within the wilderness, given the vegetation that was surrounding it. There was a fair amount of netting used to help disguise the haunt’s industrial interior from scenes like this… though, it never was completely masked, so we always had the slightest little reminders that we were still inside of a building. We also noticed a lot of sound effects. Some were scene specific, especially in the second haunt, but lots of them were bleeding over from neighboring scenes, too. There were times when it was a little difficult to really soak up what was going on around us because of the constant barrage of sounds that we were heading, but these combined with the actors’ screams and yells to help create a loud, chaotic and high-energy experience. Some examples of the effects we noticed include stacked up couches, hanging bodies, syringe-covered walls, dizzying strobes, a red swamp and obstacles in doorways (which was an interesting strategy, as opposed to keeping everything wide open). Small sections of the theme explanations can be found on their website. This is a progressive story that unveils a new “chapter” with each haunting season. But don’t worry, you don’t need to know all of the details to get a good scare. The theme wasn’t explained to us before we got started, so we had no idea what we were getting ourselves into. But, some of the characters and areas do make more sense now that we now know why they were there. The first part of the haunt takes you through the twists and turns of “Black Oak Grove.” As stated on their website, this is “where the Ghostly Willow and her cult of possessed followers roam like wraiths throughout the village.” Our journey began in the woods, eventually leading us through a cathedral and the pages of a book as we were cast into the second portion: “Factory of Malum,” which is “named after a demonic overlord who has enslaved an army of monstrous minions hell-bent on preventing you from making it out of their industrial complex of creatures alive.” According to Willow’s diary, she has entered the factory this season in search of her father, “Sledge.” Hopefully we can return next season to see how the story unfolds! Along our way, we came across many parts of a town and factory, including a school, a medical ward, a garage, a blocked-off road, a toxic waste area and more. Before our departure, we were welcomed to Black Oak Grove, so we did have at least a general idea of where we were about to walk through. However, nothing could have prepared us for the chaos we witnessed within! Because the haunt was at an overall high level of energy when we came through, it was difficult to predict the scares because we couldn’t hear them coming and, many times, they were so sneaky and swift that we didn’t see them coming either. We became victims to some good distractions that were mostly due to there being so many actors. We would often be focused on what one was saying or doing when another would abruptly appear… sometimes from above! Several more uncommon fright techniques were used too, such as the fear of vomit and syringes. Yep… if you’ve got a problem with seeing other peoples’ puke or getting poked, you might have some problems in a couple of scenes here! They also utilized a slider INSIDE the haunt that had us wondering whether we should climb the wall or hope that they actually stopped before hitting us. An especially dark and tight hallway was encountered that will likely make many feel uncomfortable as well, so if you are afraid of tight spaces or the dark, may the force be with you! We also came across threatening dialogue, sudden blasts of air, abrupt noises, intimidating actors and an overall feeling of panic. We were extremely impressed with how many times this haunt startled us! (We wanted to give some high fives pretty badly.) During our visit, the outdoor section and finale was closed, so even though we didn’t get to experience this part, it looked like haunt goers would be in for a gas-powered treat! General admission to experience all 3 haunts at Midnight Terror will cost you $25.00 per person at the door… and possibly your sanity! 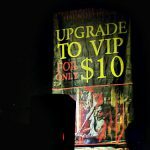 VIP tickets are also available for $35.00 and will grant you faster access to the haunt than standing in the regular line. It took our group an overall 18-1/2 minutes to navigate both of the indoor attractions. The outdoor chainsaw area was closed due to inclement weather during our visit, but we were informed it typically takes 2-4 minutes to get through. When taking the overall walk through time of about 20-1/2 minutes into consideration, Midnight Terror’s MPD (minutes of entertainment per dollar spent) ends up at 0.82. Although tour times will vary per group, that is a bit below the average of 1.5 that we see most often. However, the intense nature of the characters made us feel like we were trapped inside for much longer than that! As mentioned above, ticketing packages that include t-shirts are available and details can be found on their website. MT’s building is also home to some escape rooms and laser tag, so be sure to check those events out as well. All in all, we are hauntingly excited and thrilled that we were able to pay these guys a visit! We can’t wait to see what this attraction has up their sleeves for the upcoming years, as there sure were plenty of creative “juices” flowing here. If you are looking for an intense, in-your-face, actor-driven haunt, then this is probably a good choice for you! I loved every second of it everything about it was soo professionally done and there was not one …show more second of boredom. There was this one worker especially and her name was Jas and she was soo kind and friendly and helped me when I was confused.